This simple recipe, with crunchy fish and creamy Tzatziki sauce, is a perfect solution for a busy weeknight dinner. Heat the oven and cook the fish according to package directions. While fish is in the oven, prepare the remaining ingredients. 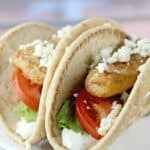 To assemble the gyro, layer tzatziki sauce, tomato, lettuce, fish, and feta in a pita. Wrap up and enjoy immediately.